Susan Cain’s book ‘Quiet; The Power of Introverts in a World that Can’t Stop Talking’ is a MUST READ book. Introverts versus Extroverts is a fascinating topic. It's a much talked about issue particularly when relating it to campuses and work places where 'personality' speaks volumes and has the power to make and break careers. And way too often, we are not sure where we fit in. That's why I thoroughly enjoyed reading 'Quiet: The Power of Introverts' by Susan Cain - it is a well-researched book with interesting, specific insights that you can easily relate to. Figuring it out: Are you an Introvert or an Extrovert? 1. Studies show that introverts are more likely than extroverts to express intimate facts about themselves online that their family and friends would be surprised to read. They welcome the chance to communicate digitally. 2. Introverts and extroverts react to rewards differently. Extroverts are characterized by their tendency to seek rewards than introverts. By contrast, introverts have a "smaller response" to rewards system and so go less out of their way to follow up [reward] cues. 3. When a couple comprises of an introvert and extrovert, there are several challenges to work on. It can be hard for extroverts to appreciate how badly introverts need to recharge at the end of a busy day and it is also hard for introverts to understand how hurtful their silence can be to their partners. Susan Cain cites the Free Trait Theory: Introverts are capable of acting like extroverts for the sake of work they consider important, people they love or anything they value highly. As Susan Cain’s book QUIET reveals, when introverts are passionate about a cause, there’s just no stopping their incredible power to bring change and become pioneers of that change! First, think back to what you loved to do when you were a child. How did you answer the question of what you wanted to be when you grew up? The specific answer you gave may have been off the mark, but the underlying impulse was not. If you wanted to be a fireman, what did a fireman mean to you? A good man who rescued people?...Gist is this: You may have known more about who you were then than what you do now. Second, pay attention to the work you gravitate to. Third, pay attention to what you envy. You mostly envy those who have what you desire. Are you an introvert or an extrovert? What’s your experience been like while interacting with those who are behaviorally opposite to you? Do share your thoughts. I would LOVE to hear from you. Really interesting post, Swapna. Now, I'm considering if I might be an introvert afterall lol I feel like I walk a very fine balance. At one time, I was in law and politics - extremely extroverted positions but not I'm writing and blogging, developing ideas by myself. I fit in very well in social settings but really need a lot of time by myself to be fully prepared for social settings. I feel like I'm in the mix of both personalities which I'm thinking may be a positive? 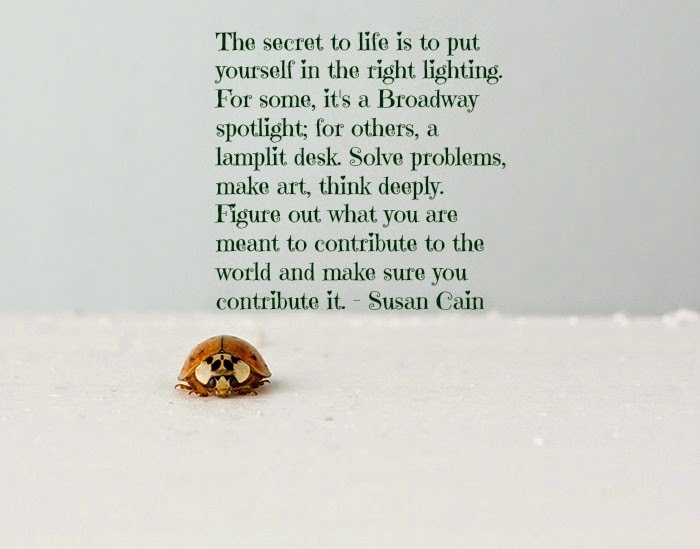 Thanks for writing up this review and Susan Cain's insights. NGDCs .. Made me think of the story of a Pandit and Boat Man too .. Pandit asking the Boatman whether he has read Epics etc and then taking a dig at him regarding percentage etc and when the storm comes, boatman asking the Pandit back whether he knows to swim .. Now a days though law insists for Life Jackets for any Boat ride, Extroverts might find it easier to float with any changing different situations from time to time whereby Introverts might find it slightly difficult getting caught off - guard with some of their usual standard defensive techniques .. But there may not be many as some Extrovert or Introvert in a pure sense and many may possess a mixed behavior with some or other psyche acting showing of with different times and environment .. just tried a rant and need not connected 2 much relity though ..
.. and just 4 some fun .. a Selfish Link .. :) .. Interesting points Swapna. I have got to *read* that book. Really interesting to read it. I will definitely read it. Thanks for sharing and letting me know about it.